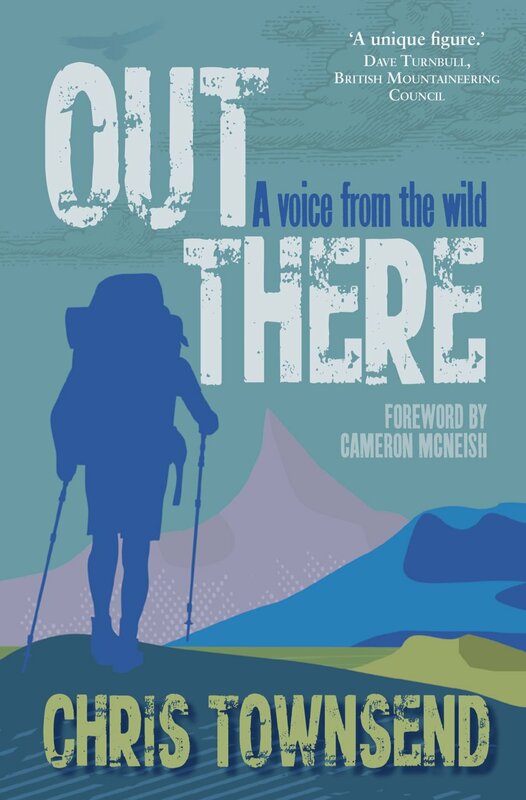 Out There, the new book by Chris Townsend, is at once an anthem celebrating the wild places and a manifesto for protecting them. I have read several books by this author but I think this is one of his most diverse and enjoyable reads yet – perhaps also his most important. When I was growing up I wanted to be a writer and an explorer. Somehow, to my surprise, I have achieved both, after a fashion. Chris Townsend is best known as a long-distance backpacker who has walked many of the world’s longest, most remote, and most beautiful trails. He’s also a passionate advocate for wild places. In this book, he takes the reader on a selection of his adventures – from building igloos in the Highlands to hiking the Pacific Crest Trail, from the Kungsleden in Arctic Scandinavia to his continuous round of all the Munros and Tops. I think the book can be best thought of as a collection of some of this writer’s best work. Some essays have been republished and expanded from other books and articles, but most of the material here was new to me and the overall message is coherent and well-tuned. Taken as a whole, the result is magnificent. The essays cover a variety of themes. The joy and simplicity of life in the wild shine through on every page, and many other important ideas are explored in depth: the definition of wilderness; how the mark of man, however small, has the effect of diminishing it; and most importantly of all how we should strive not only to protect wildness where we find it but also to help it grow. Rewilding is still an alien concept to the general population and I think it’s so important that the idea is championed in books like this – books likely to be picked up and read by a wide variety of people with an interest in the outdoors, some of whom may have little knowledge of conservation issues. While The Backpacker’s Handbook by the same author is all about the how of backpacking, Out There is very much about the why (although there are also dozens of useful tips strewn throughout). I found many of the stories hugely inspiring, for example the account of his continuous round of the Munros and Tops: 517 summits, 118 days, 1,770 miles and 175,250m of ascent. The route is described as looking like a mass of spaghetti on the map. As someone who likes nice linear or circular backpacking routes, I think I can appreciate the mental and physical toughness required to plan and complete such a project. And there are moments of humour, too, such as the account of his sandal being eaten by pigs on the GR20. Something that particularly interested me was the idea that British outdoor writers are often afraid to let their emotions show through – that those who let their stiff upper lip waver, like W.H. Murray, often produce the most powerful and emotional outdoor writing of all. I agree, and this is one reason why I enjoy Chris Townsend’s writing so much. It’s calm and rational, but he is not afraid to show the reader how much he loves the wild places, and that passion is infectious. The writing here is beautiful and incredibly evocative. …without wild places we are diminished. We came from the wild and it is still within us and without it we are nothing. Understanding this means understanding that protecting nature is vital, and that walking and sleeping in nature is the best way to reach this understanding. 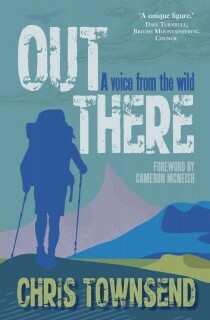 Out There is not just a wonderfully written celebration of backpacking and mountaineering. It’s also a call to arms – a warning that nobody but us will step in to save the wild places we love, and that we all have a responsibility to protect and nurture the environment. I got in touch with the author and asked him a few questions related to the issues and ideas in his book. 1. Are there any long-distance walks still on your list to complete? Any big planned adventures on the horizon? There’s a few! The Grand Enchantment Trail and the Hayduke Trail in the American Southwest – two big desert hikes, the second one really tough – are at the head of the list. First though I’m planning on walking from Yosemite Valley to Death Valley. It’ll be my own route to Owens Valley and then the Lowest to Highest Trail in reverse through Death Valley National Park. And before that there’ll be a ski with igloos tour in the Colorado Rockies with Igloo Ed in late April and then the TGO Challenge in May. 2. You mention that the most dangerous bit of backpacking you’ve done was crossing the High Sierra section of the Pacific Crest Trail during a major thaw. Since then, advances in equipment and information have made backpacking and mountaineering safer. What’s your opinion on the balance between personal safety/comfort and the need to feel immersed in the wilderness, with any risks that may entail? It comes down to personal choice I think, – what you as an individual feel happy with and what your family are happy with. When I hiked the PCT in 1982 GPS, mobile phones, locator beacons and the internet didn’t exist. My main form of communication with home was a postcard! There weren’t that many places to post them from and by the time they arrived home I’d be many days and hundreds of miles further on. So basically no-one knew where I was. Today I carry a SPOT device so I can send a message every day or so showing where I am and that I’m ok. For me this doesn’t detract from being in the wilds – most of the time I forget I have it. I don’t keep it on and send a record of my track, which I think I would find intrusive. If something similar had been available for my walks in the 80s and 90s I’d probably have carried one. I think though it’s important to be aware that such devices only actually make ventures a little safer not a lot safer. Overall I think the risks aren’t that high anyway but many are no lower just because you have a communication device. No device will stop you drowning in a river, falling off a cliff, being buried in an avalanche, fried by a lightning strike, or eaten by a bear. None of those are at all likely of course. 3. You are a passionate supporter of conservation and rewilding programmes, both in the UK and elsewhere. Although much progress has been made in recent years, the threats to wild land are arguably more severe than at any other point in human history. How do you see the next few decades unfolding, from the perspective of wilderness and our interaction with it? A difficult question! I hope that in the Scottish Highlands (where I live) there will be a more rapid increase in the regeneration and restoration of natural forests and a further spread of wild animals and birds such as beaver, red kites, sea eagles and red squirrels. And I hope that there will be a reduction in the number of bulldozed roads, wind farms and fire-blasted, devastated grouse moors. There is clearly a growing move towards rewilding and landscape conservation which I hope will lead to more effective action. What’s clear is that it will require commitment and campaigning to overcome even some of the threats to wild places. 4. If you could go back and explore the landscape at any other point in time, when – and where – would you choose? Two answers come to mind. Firstly back to the Highlands at a time when the Caledonian Forest was flourishing and there were wolves, bears, lynx and other animals in the wilds. That probably means a few thousand years ago or more. Secondly, and much more recently, back to the late eighteenth and early to mid-nineteenth centuries to travel the wildernesses of the American West with David Douglas, John Wesley Powell, John Muir and other explorers. Many thanks to Chris Townsend for these interesting answers. You can find out more on his blog at www.christownsendoutdoors.com. Disclaimer: the publisher sent me a copy of this book in exchange for an honest review. With thanks to Sandstone Press.